James Magner is all in from the big blind, and has been called by Sean Carlson in the small blind. The board runs out J♠7♥2♠6♣A♠. Carlson's king high will take it, and Magner is eliminated in 9th place. Louis Scianna raises to 200,000 preflop. John Koch calls in the small blind, and Sean Carlson calls in the big blind. The flop comes 10♥8♠7♣. Koch and Carlson both check, and Scianna bets 500,000. Koch shoves all in for around 965,000, and Carlson shoves for more. Scianna folds, and the players table their cards. The turn is the 5♠, and Koch stands up and collects his belongings. Carlson shakes Koch's hand as the river comes the 6♦,and Koch departs the tournament area. Sara Stohler got it all in holding A♦A♣ and was called by Sean Carlson holding Q♣Q♠. The flop comes K♥10♥9♥, leaving Stohler in the lead, but giving Carlson a gutshot straight draw. Stohler maintains her lead when the turn comes the 5♣, but the J♥ on the river gives Carlson the straight, and Stohler is eliminated in 12th place. Just one hand ago, Satism Surapaneni shoved all in from late position, and Kevin Kernan folded ace-queen suited in the small blind. Surapaneni showed pocket eights. This hand, Surapaneni shoved again, and Kernan called with pocket kings to double through Surapaneni, leaving the once chip leader with less than three big blinds. "It's not about the hands you win, it's about the hands you fold in tournament poker," Kernan said as the chips were passed over to him. Andrew Heckman raises to 105,000 from under the gun, and Satism Surapaneni raises to 270,000. Heckman calls. The flop comes K♠9♦7♦. Heckman checks, Surapaneni bets 270,000, Heckman raises to 625,000, and Surapaneni moves all in. Heckman calls for his 1,475,000, and the players table their cards. The turn is the 9♥ prompting Heckman to say, "Come on." The river is the 4♦ giving Heckman the flush and he takes the chip lead in the largest pot of the tournament so far. There were a total of 84 entries in today's $400 NLH Six-Max event. Those entries generated a prizepool of $28,518, with 9 spots making the money. The remaining players are now on a 60-minute dinner break. They will return around 7:40pm to play Level 25, with 12,000/24,000 blinds, and a 4,000 ante. After just eliminating a player a few hands ago, Andrew Heckman is back at it. A player moves all in holding 7♣7♠, and Heckman calls with A♥K♣. 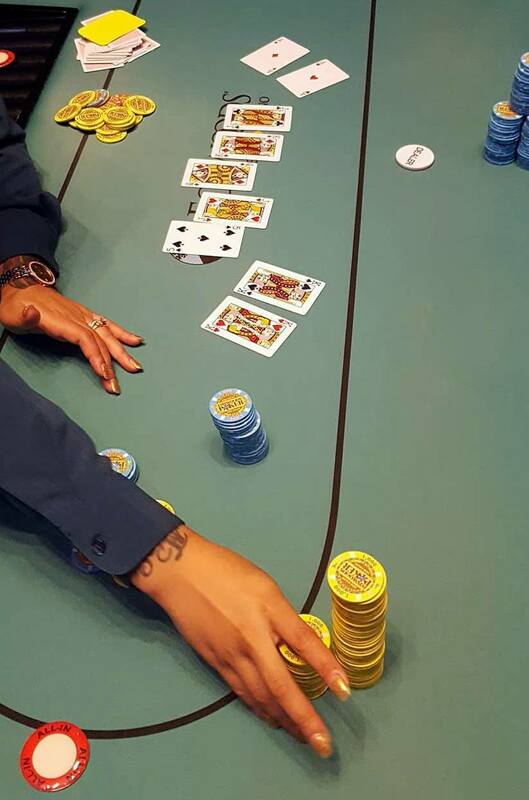 The flop comes A♦A♠8♦, giving Heckman trips to take the lead. Unfortunately for his opponent, the 2♦ turn and 6♣ river do not improve his hand, and the player is eliminated. Heckman now sits with 850,000 in chips, and one of the larger stacks in the field. Kevin Kernan raises to 50,000 in the hijack, and Rodrigo Franco moves all in from the cutoff. It folds to Natale Kuey in the small blind, who moves all in for less (240,000), and Kernan quickly mucks. The flop comes K♦Q♦J♣ giving Kuey a set to take the lead. He improves to a full house when the turn comes the J♥. The 5♠ river does not improve Franco's hand, and Kuey doubles up. Joseph Rodriquez moves all in from under the gun for 100,000, and Randall Deshaies reshoves over the top in the cutoff. All remaining players fold. The board runs out 10♦5♣5♠6♠4♣ eliminating Rodriquez in 45th place. Facing a raise from James Campbell in middle position, Jeffrey Morin moves all in from the small blind for 91,000, and the big blind shoves for less (around 50,000 total). Campbell calls both of the all-ins. "I like my hand here" the big blind says right before the flop comes A♥4♠2♣. "Maybe not anymore," he says when Morin flops a set of fours. The turn is the 8♦, and the river the Q♥. Morin more than doubles up, and the big blind is eliminated from play. Action folds to Richard Zisk in the hijack who moves all in for 76,000. It folds to Gery Lucci in the big blind who thinks for nearly a minute before calling. The board runs out 9♥9♦4♦5♥A♣ awarding Zisk the pot to double up. The player on the button raises to 17,000, and Edmund Gress moves all in from the small blind for around 75,000. Sara Stohler shoves all in over the top for 100,000 in the big blind, and the button pauses for a few seconds before opting to fold. The board runs out J♥9♣6♠6♦10♣ awarding Stohler the pot, and eliminating Gress in 65th place. The board reads Q♦6♥2♦, and both Luke Vrabel in the big blind, and Sean Carlson in the cutoff, have committed 10,000 each to the pot. The turn is the 5♦. Vrabel checks, and Carlson checks behind. The river is the K♦. Vrabel checks, and Carlson bets 27,000. Vrabel begins talking out the hand. "Did you really check back the ace?" Vrabel says seemingly referring to the possible diamond flush card that Carlson could be holding, "Or maybe you have the jack or the ten." About 30-seconds pass and Vrabel mucks his cards with a smile, while Carlson flashes the A♦, making sure to show Vrabel across the table. One player was eliminated right before break, and all remaining players are now in the money. There is around 100,000 in the middle, and the board reads A♥K♠J♠J♦. Aram Zobian checks in the small blind, and Joe Starratt moves all in from the hijack for around 50,000. Zobian thinks for over a minute before tossing in a chip to call. The river is the 2♣. Starratt doubles up, and hand-for-hand play continues. There are 100 players remaining, with 99 of them making the money, so we have reached the hand-for-hand portion of play. Play will resume until the field has been thinned by at least one player. All of the players making the money are guaranteed at least $734, and first place will take home $54,968. In the third level of play, David Salgado has tripled up, while Carlo Sciannameo was eliminated from play (with the option to re-enter). There was a three way all-in on a board reading 8♥4♥3♥. Sciannameo had flopped two pair holding 4♣3♣, Andrea Rizzo flopped a flush holding K♥2♥, and Salgado flopped the nut flush holding A♥Q♥. The K♦ turn and A♦ river did not change the hand, and Sciannameo was eliminated from play, while Salgado tripled up, and Rizzo was left with only 6,000. Poker Professional Mark Walsh is in today's six-max field looking for another Foxwoods globe trophy. Walsh took down the Foxwoods Poker Classic $400 six max event here at Foxwoods in March of 2016, and is hoping for a repeat performance. Walsh is a native of Boston, Mass, and is well known in the the Foxwoods poker tournament scene. Other notables in today's six max field include: Tim Reilly, Paul Freedman, JeWook Oh, David Grandieri, Ivano Panetti, and Seunghwan Lee, and Carlo Sciannameo. Day 2 play starts at noon on Thursday October 12th.